What do you do when you have a lot of desk research to complete for a design project, but not a lot of time? RESEARCH SPRINTS. While the module is more about doing in-person user research, there are still lots of questions that need to/are better answered using desk research. However, this brief leaves so much to be explored that our team wanted a way to research the most amount of information in the most efficient manner possible. Rather than assign one or two team members to complete all this research, we decided to prototype an agile method for desk research, we called it “Research Sprints”. The following is a guide/reflection piece on our process. What brands are engaging best with millennials? How are they engaging with them? Millennials & charities: What are they giving and how much? What’s the state of religion and millennials in the UK? Who are the influencers and voice of the millennial generation? Give each person in the group a topic area to research. In a second iteration of this process we decided to tackle a book instead of crawling the internet. Rather than assign research topics, each of us took one chapter from a shared e-book. Your team now has ONE HOUR to find the most important and salient pieces of information about their research topic. Limiting the time to one hour forces you to try and find the best articles without wasting too much time collecting extraneous amounts of information. It also forces you to skim rather than slowly reading everything. You know that with limited time you can’t try and collect everything, so your brain is pushing you to search for the best. It can be easy to get caught up in reading a “semi-related” article to find that ONE interesting sentence or quote. For a research paper that might be great, but for the sake of this exercise it’s probably going to be a waste of time. After the one hour passes, it might feel like you just did a 5 hour research jam session. Take a quick tea break. After everyone’s mind has settled come together to share your findings. First we wrote each research topic up on a white board. Then went around the group and each person read out their most salient findings. We had a facilitator write each point onto a Post-It and put it up on the wall under the research category. This gives everyone a chance to hear each other’s findings without having to read through everyone’s notes. 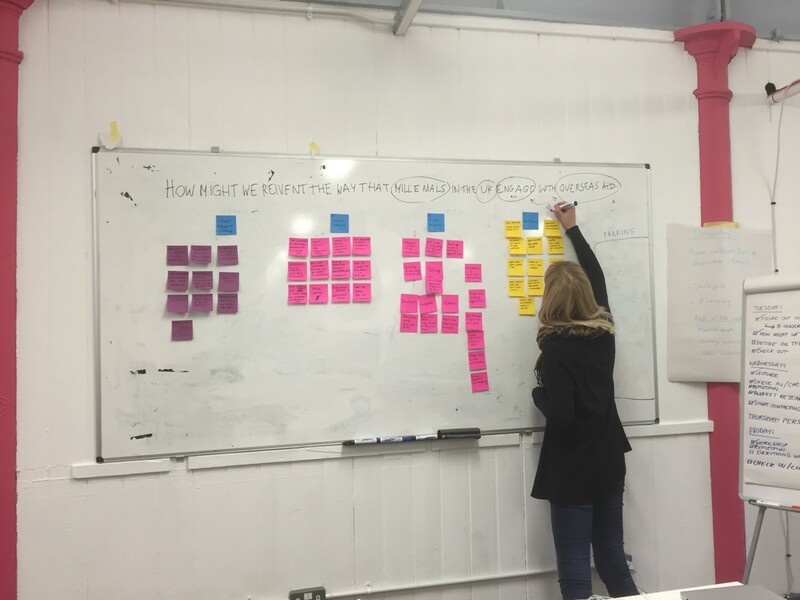 In the second iteration of this process with the book sprint, each person wrote their own Post-Its rather than having a facilitator them down. After reflecting on the first process we felt that less information would be lost in translation by writing them yourself. It would also force the researcher to once again cut down their findings to a Post-It note size making it more shareable to the group. After all the research is posted on the board you will probably have heard some interesting bits of information. Discuss with your team and see if there is any key insights or new pieces of information you weren’t anticipating to hear. This is also a chance to further define research areas that you might be missing. In the first round, we came across a book that would have been too long to get through in the hour so we did the second iteration of this process with that book. The Post-It note session is a great way to share the main points you found, but there is probably a lot of detail you weren’t able to share. Each person should take their notes, clean it up and add it to a shared document. In the end you should have a document with the research topics along with more detailed summaries of the information found. Hint: Include appropriate reference sources in the proper citation format now for easy reference later when you might need to include it in a final report. In the second iteration with the book, we felt we were able to capture the important points of information on all the Post-Its. Maybe this was because we wrote them ourselves so we were more sure everything was shared that needed to be. So rather than having each person upload their notes to a shared document, we had one scribe simply document the Post-Its from the white board. This research method isn’t the most academically rigorous or thorough, but we’ve found it to be extremely effective at distributing a large amount of research between team members. Not only is it a good way to split up effort, but it provides a great method to share and document everyone’s research without it getting lost in someone’s head. Let me know if you’ve done something similar to this method, or let me know what your experience is after trying this!